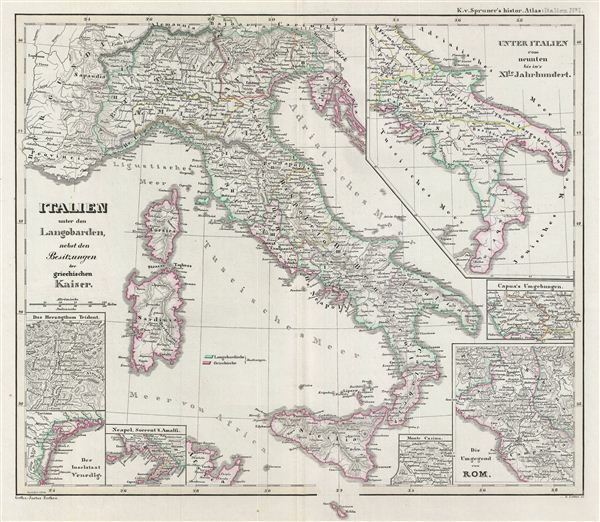 This is Karl von Spruner's 1854 map of Italy under the Lombards. The map covers peninsular Italy as well as Sicily, Sardinia, and Corsica. The map also features seven inset maps. The Lombards were a Germanic tribe who ruled the Lombard Kingdom of Italy (Kingdom of Italy) from 568 to 774. The kingdom reached its peak under Liutprand in the 8th century. In 774, after Charlemagne conquered the kingdom and integrated it within his empire, some Lombard nobles continued to rule parts of the peninsula until they were incorporated into the Norman Kingdom of Sicily. The whole is rendered in finely engraved detail exhibiting throughout the fine craftsmanship of the Perthes firm. Prepared by Karl Spruner for publication as plate It I in the second edition of Justus Perthes' 1854 Historich-Geographischer, Hand-Atlas zur Geschichte der Staaten europa's vom Anfang des Mittelalters bis auf die Neueste Zeit.